Siri isn’t the only amazingly life-like tech making the rounds this week. Meka is intended to design a robot that builds emotional links between humans and the machines themselves, and at the recent Intelligent Robots and Systems event, Professor Sentis of the University of Texas showed off Meka’s most recent iteration. He’s extraordinarily engaging–courtesy of camera-equipped eyes, smooth motor drives, and seven degrees of motion. 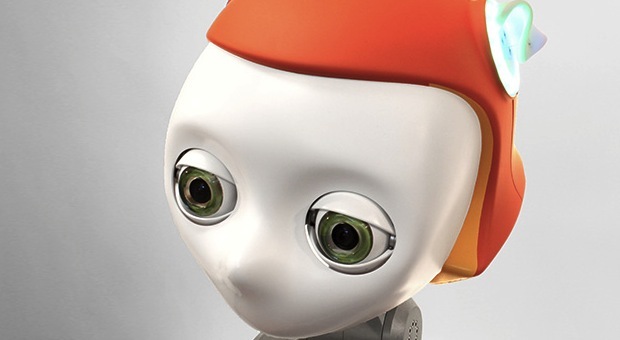 Unlike other androids, like the hyper-realistic Geminoid series, Meka’s looks are deliberately non-realistic, right down to his glowing ears. Would that make you trust it more than a robot that’s creepily realistic? This week the tech world has been blown-away by Siri, the (slightly) artificially-intelligent voice-activated assistant in Apple’s new iPhone–particularly because the way Siri is programmed makes it able to understand natural language to a certain extent and even understand context, in a limited way. But Siri is nothing compared to the research of Osamu Hasegawa at the Tokyo Institute of Technology. He’s created a system called Self-Organizing Incremental Neural Network, SOINN, which means instead of mutely and un-intelligently following pre-programmed tasks, his Kawada Industrie’s robot called Hiro can actually perceive and interpret information about the real world environment around it, and process existing knowledge, to complete an assigned task. For example, by training an inquisitive robot like Hiro to do a number of tasks–with the robot querying for help when it’s not sure about something–he thinks it’ll ultimately be possible to ask Hiro to make a cup of tea, and have it share knowledge with a robot in England about how to complete the task (something this robot has learned itself). Such a flexible learning system, coupled with powerful image recognition tech could also let the robot bring you soy sauce to the dining table on request–even if it hadn’t seen soy sauce before. But Haswgawa is sensitive to the kind of fear such a smart robot could create, and he notes that this tech is already here–so the start of a public debate is necessary. We’ve seen a couple of dog-like robots in development–the tech has advantages over more human-like walking ‘bots because the problems of balance and general locomotion are much simpler to solve. Meet another one, SQ1 from South Korea’s SimLab. He’s a technology demonstrator so that the company can perfect the walking software, and iron out any wrinkles in the gait of the dog-bot which is actually a much bigger project on the scale of BigDog himself. Looks like the tech is working! What we can learn from this is that when robots do make it into our everyday environment, they may sometimes look more like SQ1 here than two-legged machines like ASIMO–for all sorts of reason, including being more stable, which is probably helpful if one is carrying objects around. We’ve mentioned many times that robots will find ever-more useful roles in post-disaster scenarios, and they have demonstrated some of this promise in the cleanup at the Fukushima nuclear accident caused by Japan’s earthquake and tsunami disaster. The Fraunhofer Institute has been looking into the phenomenon, and notes that the International Federation of Robotics thinks that robots are so immediately usful that their exploitation in emergency response scenarios will increase to 17% of disasters by 2013. But the Fukushima disaster has demonstrated one weakness in this kind of situation: Multiple robots on scene from different manufacturers have different control systems, need different types of controller expertise, and deliver different types of sensor information about the scene. That’s something Fraunhofer wants to fix, and it’s designing what’s called the “Sensor Network With Mobile Robots For Disaster Management” project–SENEKA. The idea is to come up with a common system that can network together a bunch of information from different robots and sensors, and even let the individual robots communicate with each other. SENEKA is so promising, and plain sensible, it’s something we expect to hear more about.